Am I more Asian than a critic, or more critic than an Asian? It all started in December on a cold, cold night in Texas, in the most sheltered place I’ve ever had the pleasure of staying in. Once BoJack said, “Chapter one. CHAPTER one…” I was sold. 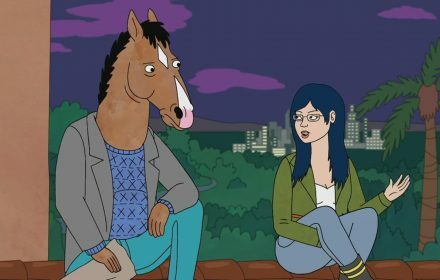 Despite my complete ignorance of the current world of Hollywoo, I took this on and decided that I was really going to get into the essence of what this show is, which I’m sorry to say, many people, BoJack fans included, probably don’t get. Though I didn’t get to expand on Princess Carolyn’s urban German bourbon blurbing, as I explained to PlutoBurns, every word in this half hour review (by far my longest) has been uttered with purpose. I cannot say this about any of my other reviews– I gave it everything I had because it sincerely deserved my full attention. My hopes are that this show will gain much more respect despite its overwrought-ness, verbosity, and its general lack of ability to portray an Asian female correctly. It’s not perfect, yes, but its deeper message is indisputable, which I applaud over and over again. Here’s my heart, people. Eat of my flesh and drink of my blood. Boxer vs. Raptor! Na-na-na-na-na-na!